After sniffing around the internet for the most chic fur-niture for dogs I’ve compiled a list of beds designed for mod dogs, their homes and their hoomans. Whether your style is midcentury, eco-concious, print-based, simple or trendy you’ll find what you need to modernize your pooch-friendly home by giving your fur buddies a cozy place to lay their butts. For the eco-concious pawrent. These basket shaped beds are constructed of 100% organic and chemical-free wool felt with interchangable, colorful cushions. Hip, cozy, & comfortable! Pup approved mid-century mod never looked so good. Inspired by the mecca of mid-century architecture, Marin County. Standing at 3″ tall this bed would be the perfect snoozing station for low riding fuzz butts such as Corgis, Doxies, & Bassetts. Nice Digs line of stylish accessories for hounds is stunning! Their bold, graphic prints for pups are a refreshing take on standard pet products. Their beds will bring light & puppy cheer to any room fit for paws. 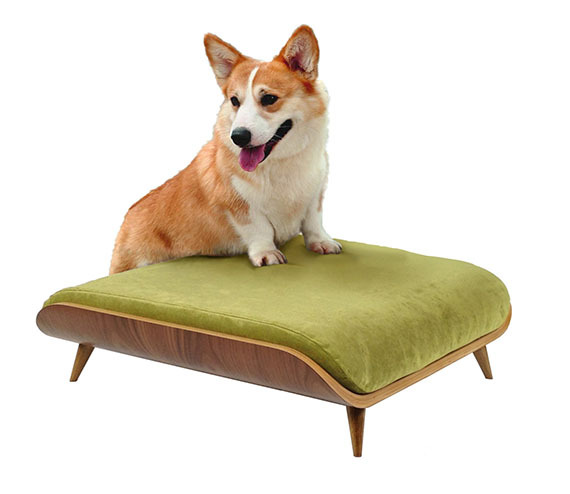 I love this simple & chic platform dogge bed inspired by classic Danish design. With it’s clean lines & unique customizable woven center this bed was made for both the modern dog & the modern hooman. Every dog needs their own personal fort. This teepee doubles as a fort AND a bed with it’s 1″ removable & washable cushion that is made to perfectly fit in your pup’s new clubhouse. Afternoon napping just got so much cooler! These trendy hand dyed indigo pooch beds are designed for the most fashion forward dogues in the park. If Coachella was four-legged friendly all the pups would be lounging on these jamming out to their favorite bands! This made-to-order solid wood dog bed will compliment your interior design while providing a cozy place for your pup to catch some z’s. PUP and KIT beds are a little higher in price but the quality & beautiful design is top notch & well worth the splurge! Simple, modern doggy design. This is my favorite style of pet products. Doca Pet has mastered it to pawfection with their small line of thoughtfully designed dog feeders & beds. The concept behind Hess In House’s line of home decor is splendid for dog lovers! Their beds are not only re-dog-uliously comfy with their fleece top, but they will match your Hess in House home decor! They have 100s of textiles to choose from & you can even have a custom hound & human set designed! I was just saying how a hammock was on my list of summer essentials for lounging with my pups. This dog hammock bed takes that idea to a whole other level of pawesome! Not only is this pup lounger beautifully designed, it’s unique sleeping surface responds to your pet’s body weight and claims to help relieve many of the pressure points that create discomfort and often lead to arthritis in senior tail-waggers! The furrier the better when it comes to furniture for dogs! The NESTo beds by KipPets are made of high quality materials & are extremely durable & cleanable. The perfect place for your furry bestie to make a nest of their bed & snooze their afternoon away in style. Austrailian dog designers generally just get it & Pooccillo is no exception when it comes to superb dogue style. Their products are designed for people who are passionate about their dogs and the design of their homes. The colors and patterns that their dog beds are constructed of are to die for, I want a different one for every room of my own house! Functionality, durability, & clean style is what German design studio Cloud7’s modern dog wares are all about. Their waterproof version of their signature “Sleepy” bed style is something I have not seen before. This bed would be exceptionally useful for all the outdoor enthusiast dog lovers & adventure hounds out there! This is a pupular style of sleeping quarters for dogs. This cuddle corner is very affordable & comes in a contemporary color way that’s diggable. It also transforms into a traditionally shaped pup bed. This lovely pine indoor dog house provides the perfect oasis for your small or medium size pooch to retire to after a long day of playing. The house also includes a feeder area, supply space, and a place to hang leashes & other pup accessories!